The concept, borrowed from the Marvel Comics limited series (the very first Marvel limited series) of the same name, is fighting game gold. The Collector has devised a way to bend superheroes and villains to his will, forcing them to battle at his behest. The player takes on the role of a Summoner, tasked with building their team and pitting them (at least initially) against that of infamous time-traveling Avengers villain Kang the Conqueror. Note the chat at the bottom of the screen. Marvel Contest of Champions is a free-to-play collectible character brawler developed by Kabam. You may know them from various mobile and Facebook strategy games like Kingdoms of Camelot and Dragons of Atlantis. They've taken a promising concept and made a game that's as bland as a Marvel Comics-based fighting game could possibly be. Marvel's most iconic characters are transformed into personality-free puppets. Spider-Man does not quip. 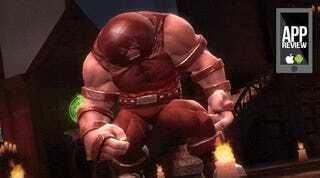 The Juggernaut does not roar. Cyclops doesn't accidentally kill his mentor and become a pariah to a community filled with mutants who've done far worse on purpose. Here Marvel's finest are collectible action figures, gifted to players randomly through dailly crystal drops or purchased at a premium through the in-game store. For $19.99 I can purchase a special limited starter pack which includes an assortment of items, some in-game currency and an exclusive Deadpool to add to your character roster. Or they can add premium currency to their account starting at $4.99, which will give them a chance at one of the game's more powerful collectible hero figures. So it's one of those Puzzle & Dragon-style games, only instead of collecting monsters to use in a puzzle game, you're collecting Marvel characters to use in a pretty basic fighting game. Each character has a type that's stronger or weaker against other types. Each character can be leveled up using items won through story progression or player-versus-player battles. Rare characters have access to more and stronger attacks than their common counterparts. Kabam would really like it if you spent a lot of money on rare characters. The battles themselves look pretty enough, but the actual gameplay is quite basic. Tap the right side of the screen for a quick attack, swipe for a medium hit. Hold and release for a guard-breaking heavy hit. Holding the left side of the screen blocks. A super meter fills as the characters clash, allowing the player to unleash special attacks. Newcomers to the fighting genre will find the battle system quite accessible. Veterans will be mildly amused. You can see the game running on my iPhone 6 below. I left the initial loading sequence intact so you can be annoyed with it as I was. I can barely watch the fighting — especially the post-battle celebrations. They make me cringe. It's like there was supposed to be voice there, but they didn't put it in. I could forgive a lot of Marvel Contest of Champions' faults if the characters were actual characters instead of mannequins. But those stupid mute faces only accentuate everything else the game does wrong. The always online requirement. The long load times. The server instability. The energy meter. The health regeneration timers. The cost to purchase a rare crystal for a chance at a more powerful warrior. It's my least-favorite flavor of free-to-play without enough Marvel flair to make me forget.